Ursus Rare Books has released their Catalogue 343 Imagination & The Illustrated Book from Piranesi to Present. That is a date range, or more specifically, 1748-2017. These books are mostly artistic in one fashion or another. Some are works of art, some artists' books, others just graced with wonderful illustrations. Several are combinations between visual artists and literary ones. The artwork is quite original, often unusual, surrealism often popping its strange head. These are a few items to be found in this collection of illustrated books. Life was not easy for the great artist and engraver William Blake. Between perfecting his art and making enough money to get by, it was always a struggle. Perhaps that is why he was so fascinated with Job. He didn't suffer quite as much as the biblical figure, but it is likely Blake could relate to him, his struggles and ultimate redemption. Still, it wasn't until late in life that he took on his Illustrations of the Book of Job. It was published in 1825, two years before his death, when Blake was age 68. Two years earlier, his friend, the painter John Linnell, commissioned the series. Blake was never much appreciated during his lifetime. It would take several decades before he began to get his due recognition, but Linnell recognized his extraordinary talent before others and provided the funds Blake needed. These illustrations are quintessential Blake, spiritual, otherworldly. Each has a caption quote from the Book of Job or other part of the Bible, while other quotes reflecting Job's struggles can be found at the top. Decorative borders otherwise surround the images. As Ursus points out, the illustrations "must be seen to be fully appreciated." The bookseller notes that this is an unusually clean copy, without the significant foxing seen in most, though it has not been washed. Item 2. Priced at $85,000. Next we have a familiar early venture into science fiction, though you may not recognize the title unless you speak French: Les Guerre des Mondes. This is a 1906 Brussels edition (in French) of H. G. Wells' The War of the Worlds. This work is known not only for its written merit, but for the 1938 radio enactment that had many Americans believing America was actually under attack by Martians. While a later edition translated to a foreign language is usually not a very desirable one, this edition is desirable because of its illustrations. They were provided by an obscure Brazilian artist, Henrique Alvim Corrêa (translated in the French edition to Henri Alvin Correa). These are a nightmarish bunch of illustrations that will relieve you of any misconceptions that Martians are cute little green men. You will not want to be the first person to travel to Mars once you see who lives there. I cannot vouch for this, since I understand not everything you read on the internet is necessarily true, but reportedly, Corrêa, who had moved to Brussels to set up his studio, traveled to London to show Wells his artwork. Wells was so impressed that he asked him to illustrate his upcoming French edition of The War of the Worlds. Again, according to internet sources, Wells later said, "Alvim Corrêa did more for my work with his brush than I with my pen." Whether apocryphal or real, these illustrations are worthy of such praise. Perhaps the reason so few people are familiar with Corrêa is that he died just a few years later of tuberculosis at the age of 34. Item 13. $8,500. 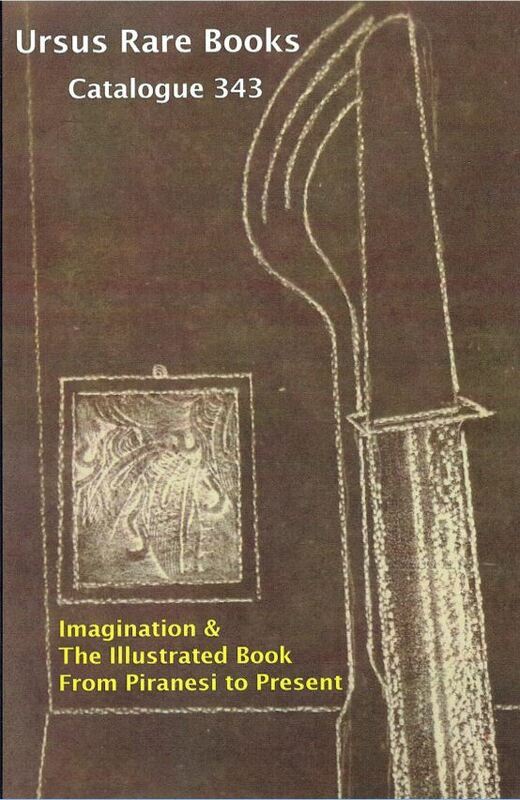 Here is another illustrated book with drawings strange enough to match those of Corrêa. This is surrealism long before that term was invented. J. J. Grandville was a French artist of great imagination. By the time he got around to this book, which Ursus calls "Grandville's masterpiece," he had done much illustration work for magazines and books. He did caricatures for magazines, his wit making them popular among readers. When restrictions were placed on caricaturing people, he turned more to book illustration, often with classics. Item 4 is Grandville's Un Autre Monde. Transformations, Visions, Incarnations... published in 1844. The first part of that title translates to "an other world." That it is. Bizarre creatures and such inhabit this very strange, surrealistic other world. It was nothing like anything seen before, and it became influential on other artists such as John Tenniel. It clearly was influential on the drawings Tenniel created for Lewis Carroll's Alice's Adventures in Wonderland. Grandville's drawings provide a preview of them. $9,750. These next drawings are not surrealistic, but rather, futuristic. They come from the most unlikely of places. Item 31 is Arkhitekturniie Fantazii (architectural fantasies), published in 1933. This is a collection of 101 architectural designs from the vivid imagination of Yakov Chernykov. It contains drawings of cities, structures, factories and such with designs far ahead of their time. Ursus describes this as "one of the most exciting books on architecture issued in the twentieth century." Compton, in his writing about Russian avante-garde books, says his "almost unlimited imagination for architectural forms provides a pattern book for modernist architecture, rather than a repertoire of viable designs." Here is why this book is so surprising. Imaginative, avant-garde work is hardly synonymous with Stalin's Soviet Union. Drab, gray, practical was the order of the day. The result was very few of Chernykov's designs were ever used, and the avante-garde in the Soviet Union was quickly repressed after this time. $12,500. Here is another strange book, but in a very different way. Ursus describes it thus - "A stupendous object, in a binding that is completely over the top. Fascist bombast at its most preposterous." This one was commissioned by Mussolini, who was not shy about being self-aggrandizing, to celebrate his subjugation of the people of Ethiopia in 1936. This work was produced in 1937 by Celso Maria Garatti, the title being Italiani di Mussolini in A. O. (Italians of Mussolini in A. O., "A. O." being Africa Orientale or East Africa). It features a cloth binding with copper tubes along the spine and an onlaid metal axe protruding over the front cover. An axe and rods is a fasces, a device for clearing people out of the way in ancient times. It became the symbol of the fascist regime. This large folio book is filled with pictures, mostly photographs of fascist control of Ethiopia. It didn't last long. By 1941, the Allies, mainly the British, had thrown the Italians out of East Africa. Item 43. $8,500. Ursus Books may be reached at 212-772-8787 or pkraus@ursusbooks.com. Their website is www.ursusbooks.com.